There are numerous worthwhile organizations that have put an inventive spin on charitable good-works and community outreach, and many may provide a service or a resource that is unconventional and innovative. There are some that dedicate time to working with particular populations of often overlooked individuals while some other groups may dedicate their time and energy toward providing services to a common group that are unique or slightly alternative. There is some evidence that music has therapeutic and beneficial effects on people; this is also said to be true in the case of individuals who suffer or struggle from affliction, defects, or impairments beyond the conventional treatment methods used by doctors and practitioners who may be providing care or prescribing medications for particular individuals. In fact, there is such a compelling case to be made for the positive impact of music, theater, and the arts, that many treatment facilities have adopted programs and therapy models that embrace these entities for the clients that they serve. Some enlist actual musicians or performers to come and visit patients in a hospital or other treatment setting, while some simply replicate the effect through art and music therapy sessions. There are some clever and conscientious individuals who comprise a group that recognizes the instantaneous relief that the arts provide, and that have created their own organization that is dedicated to providing such enrichment in the lives of those who might otherwise be deprived of some such splendor. The group, “sing for hope”, aims to provide a respite to those in distress with song, theater, and art. 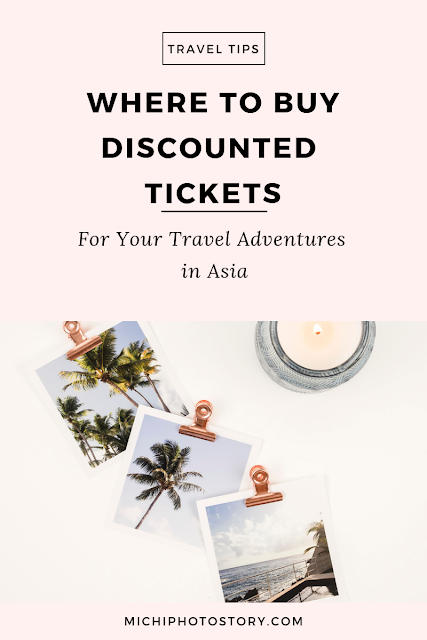 They perform in unlikely venues for populations that might not be able to afford or access such offerings without this contribution. 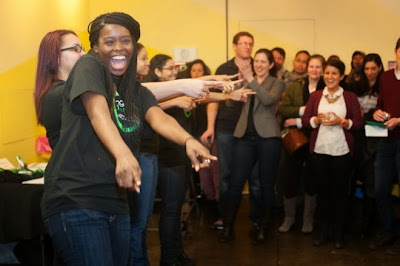 The performers in the group do not get paid for their service, and they strive to interact with their audience in a meaningful and personal way. The result is inspiration- both through the craft- and through the dedication and attention that each shows to their art as well as their audience members. 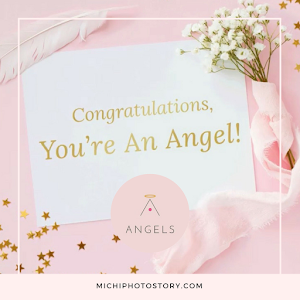 The provision is not funded by any formal group, and some communities may make donations to the group to ensure continued provision of their artistic expression amid an audience of appreciative and inspired spectators. Other individuals may donate their talent and contribute to performances for these receptive audiences in various regions world-wide. Well, just like that Christmas is already over and I was happy that even it was so stressful we were able to celebrate it. One week before Christmas we were all sick. My son was not able to take his exam because of the viral fever and bronchitis, my husband had colds and cough and I have colds too. I had to go to ENT day before Christmas Eve because I had small bumps and rashes in my nose due to colds. The doctor prescribed oral and topical medicine at baka maging Rudolf daw ang nose ko sa pula. But God is so good because my son was able to attend their Christmas Party. My husband invited my in-laws for lunch in our house so I have to prepare meals. Initial plan is I will just order food so I won’t be stressed and tired but the store was closed so I have no choice but to cook. While I was cooking, I ran out of LPG and fortunately my husband was able to buy gasul but the price is so shocking, P1000 already. 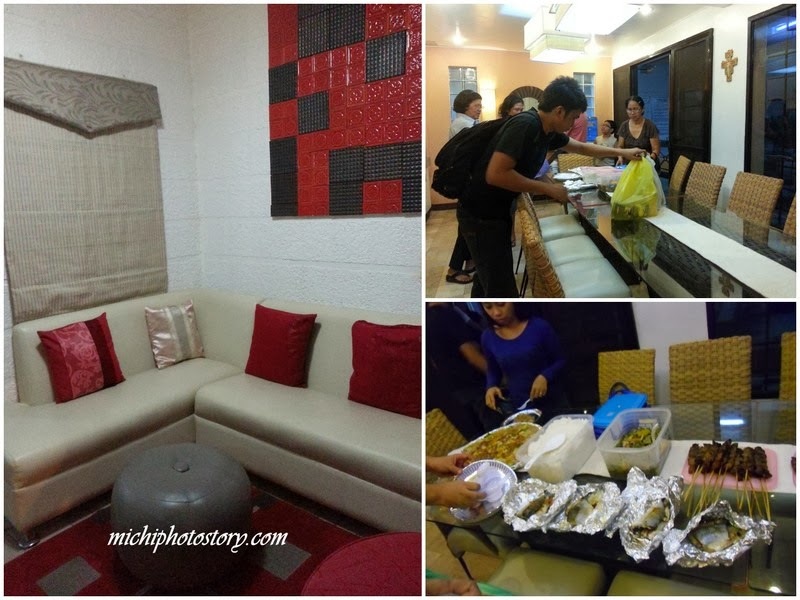 #soexpensive Anyway, I was able to prepare Kare-Kare, Roast Chicken, Ham and Brownies for dessert. No more pasta or pansit. 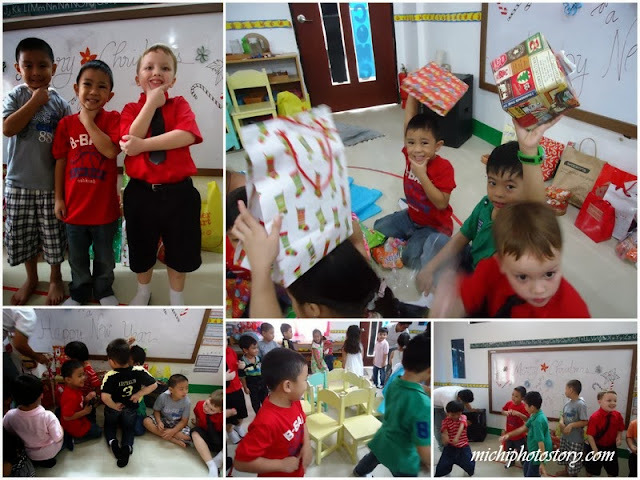 We had exchange gifts worth P50. Hehehe! The following day we went to Victoria, Laguna for our Christmas reunion. 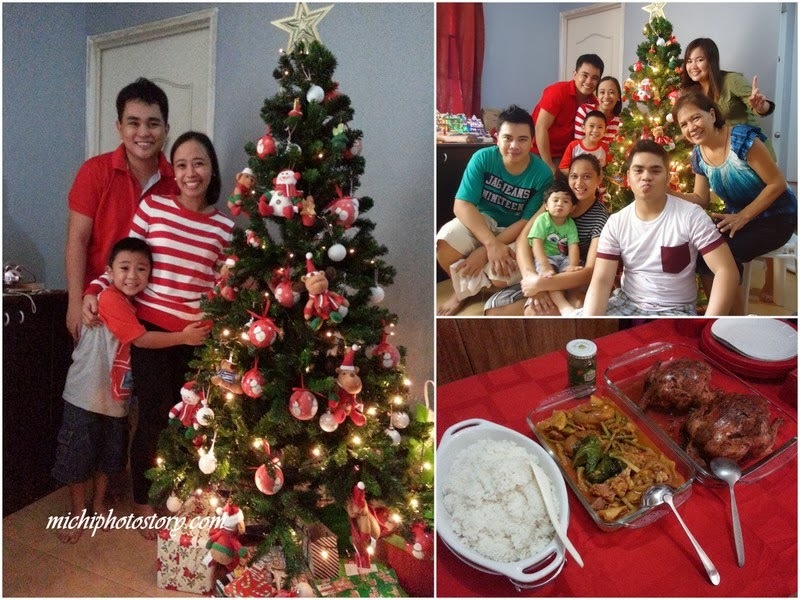 It was our first time to celebrate Christmas with our Aunt Lida. We had games for the kids and raffle for the adults. 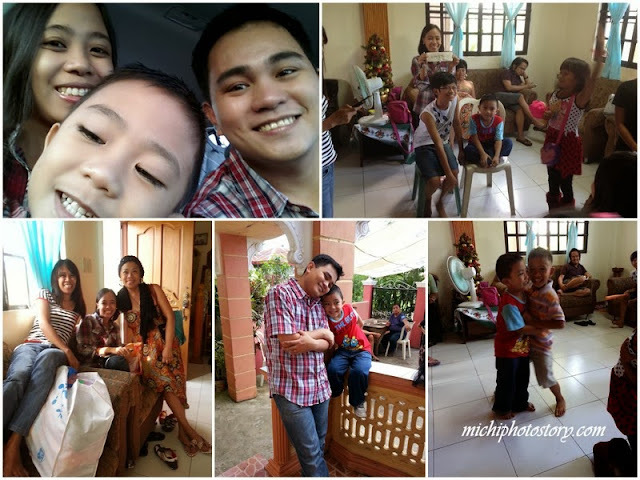 Few more days and we’re going to welcome year 2014 and now I’m busy with cleaning and decluttering our home. I’m happy to say that I’m done with gift wrapping because I did not wrap those big gifts like bike and lap desk for my son. 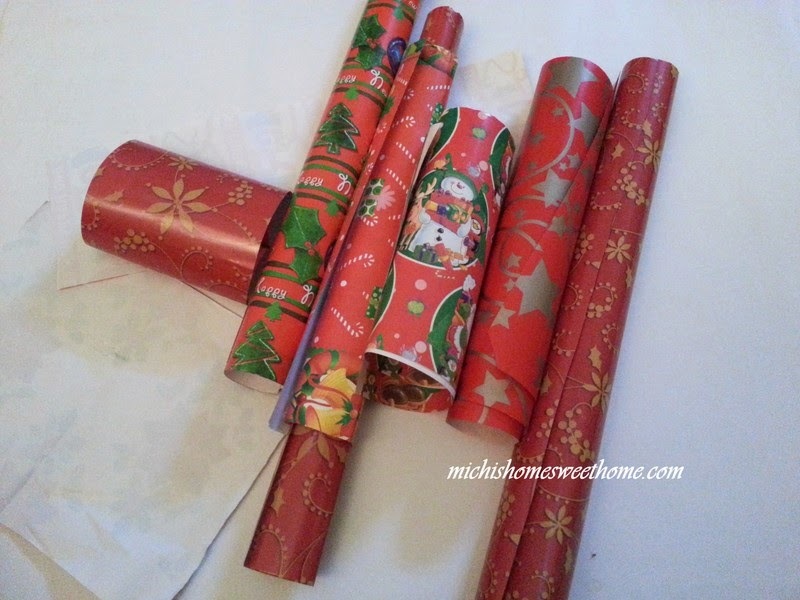 #nanghihinayangsagiftwrap Anyway, I always save those leftover gift wrap just in case I need it. 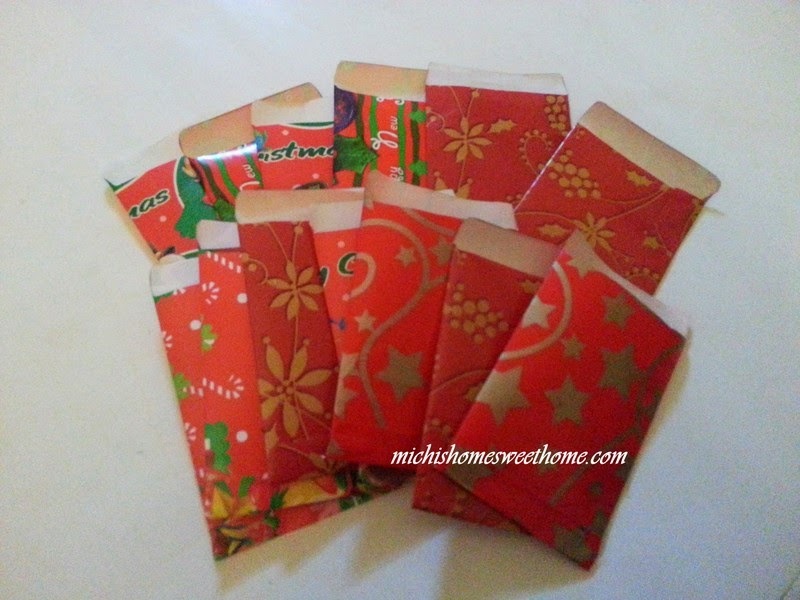 This time instead of throwing those leftover, I’ve made Christmas envelopes. 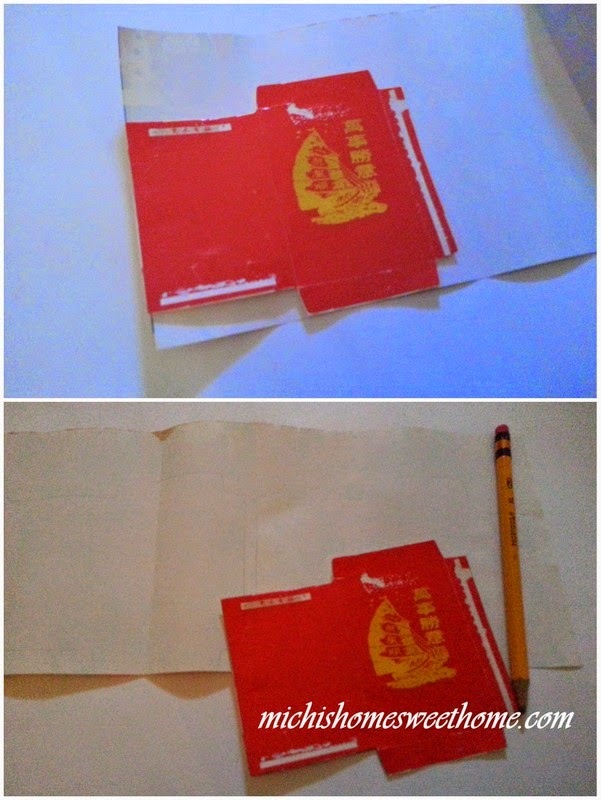 It saves me from buying angpao, money card or envelopes, I used my DIY Christmas envelopes instead. 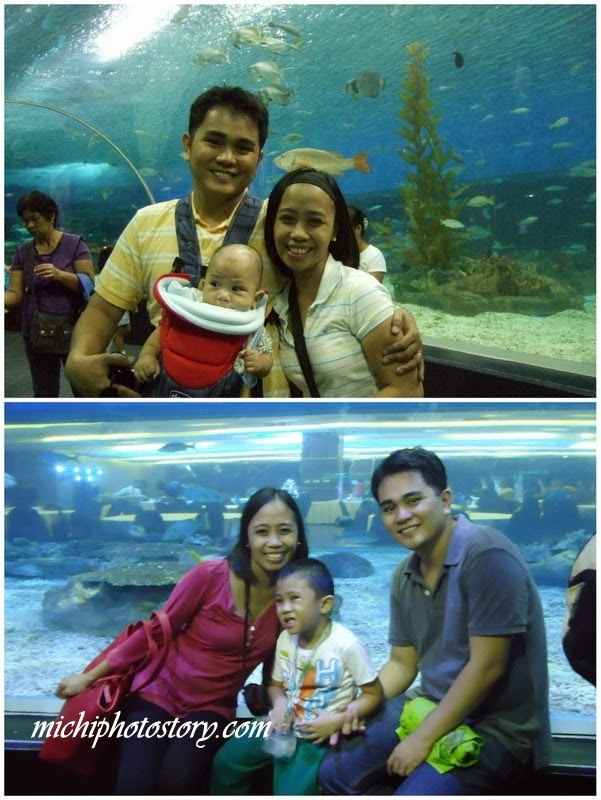 We first visited Manila Ocean Park last February 1, 2009, my son was only four months old during that time. I’ve been meaning to revisit the park again because of the new attractions but it never happened so I was really happy when I saw that Manila Ocean Park is included in my son’s field trip. It was our chance to visit the park again. 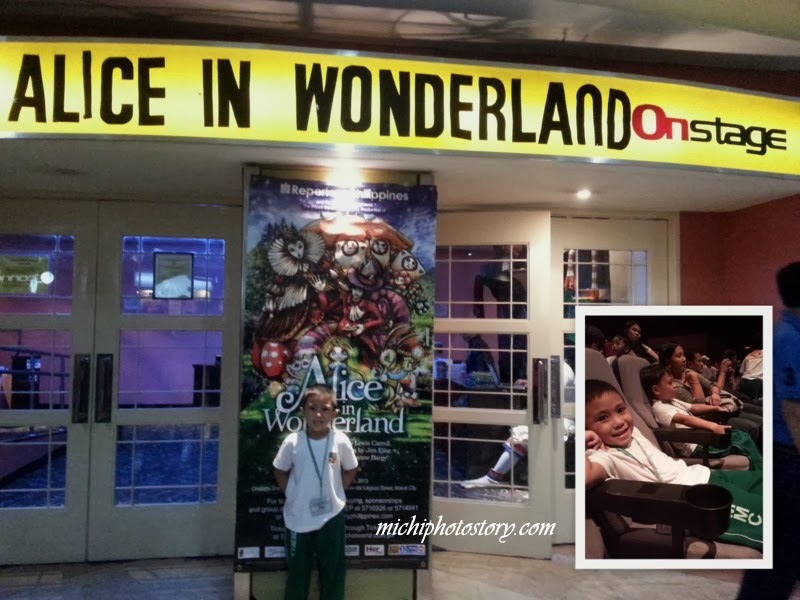 It’s like a first-time visit for my son, for sure wala siya naalala dati. Hehehe! 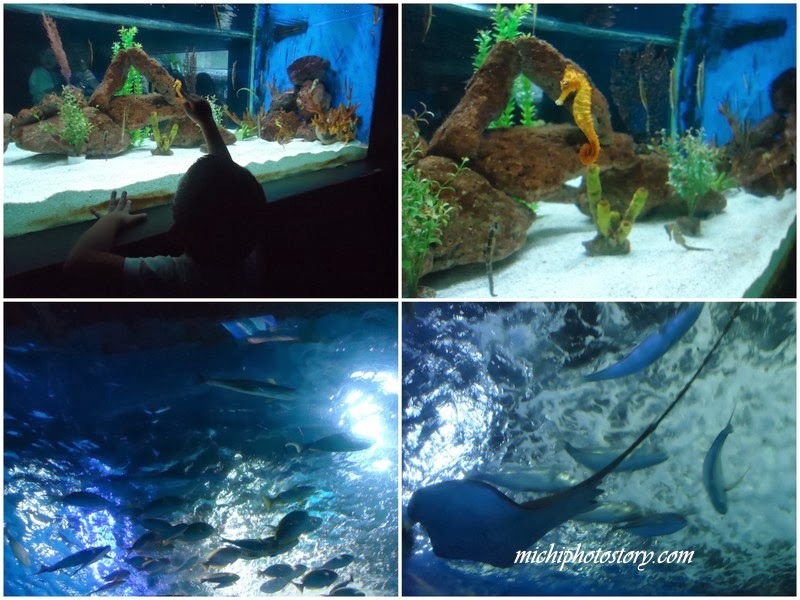 I don’t see any major changes in the Oceanarium except on this picture. 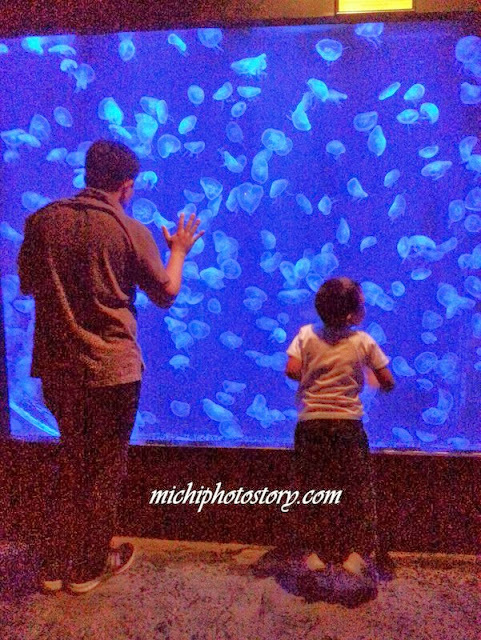 See through na kasi yung aquarium so panget na background namin. 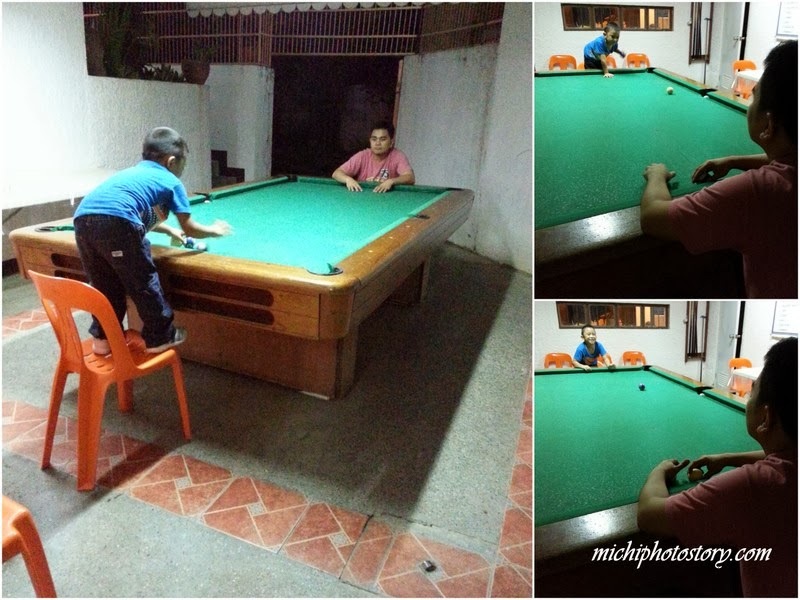 Before fishes ang background, now you can see tables and chairs. This is one thing that I look forward to experience but I was disappointed because no picture allowed and sila lang pwede magpicture, of course you have to pay. We were able to touch the stingray but no souvenir picture. 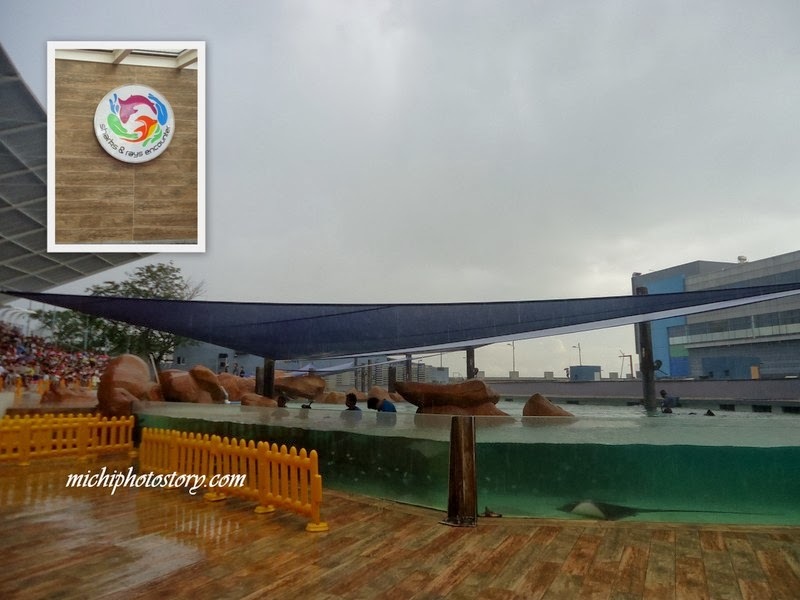 There is nothing special about this place, they will just inform and show you how they maintain the aquarium, from cleaning the water, breeding the fish and others. 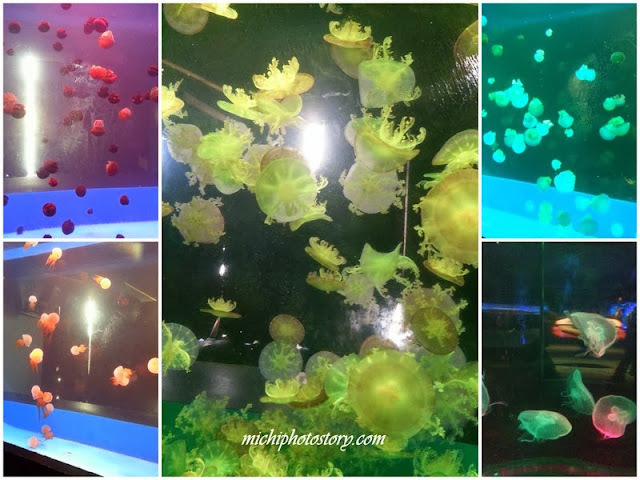 A small room where you can see different types of jellyfish. The last part of our itinerary is Shark Anatomy, I thought they will discuss shark but we ended up watching a magic show. Comparing my first and last experience, I enjoyed the first visit because it was not crowded and no time pressure. Before I joined Bazaar, I already said yes to our Asian PsorClub Christmas Party so even I’m super busy with the bazaar I took time to attend the party last Saturday because I seldom see them in a year. 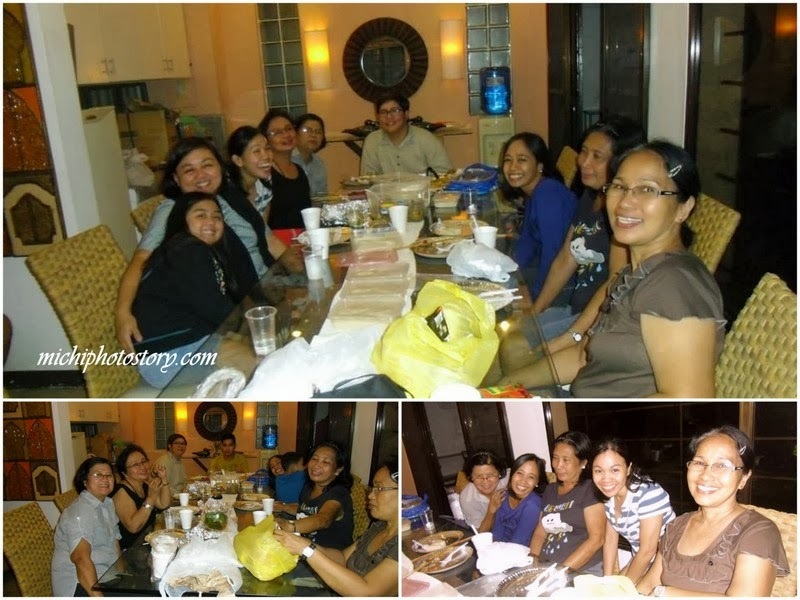 Again, it was a simple get together in a resort in Los Banos, Laguna. Since, I’m busy and I have no time to cook or bake, I just ordered pansit for my potluck. The traffic was so bad and nakatulog na sa biyahe ang aking anak. It was an overnight party but we did not stay long because my husband has a Christmas Run the following morning. Ilang hours na tulog for his first fun run. According to webmd.com, kitchen sponge is the number one source of germs in our house because of the micro crevices and moist that makes it cozy home for the germs. 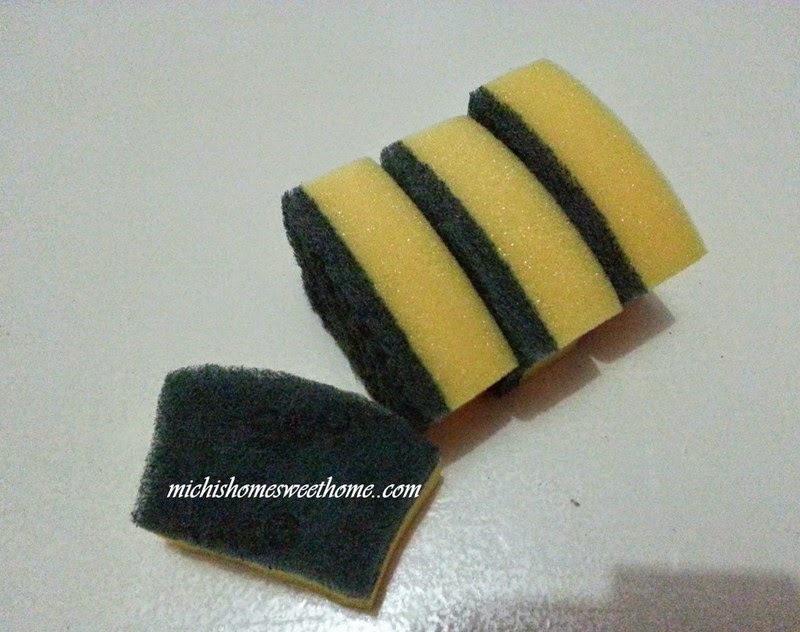 And because of this, I change my kitchen sponge every week and to save, I cut our sponge in half. 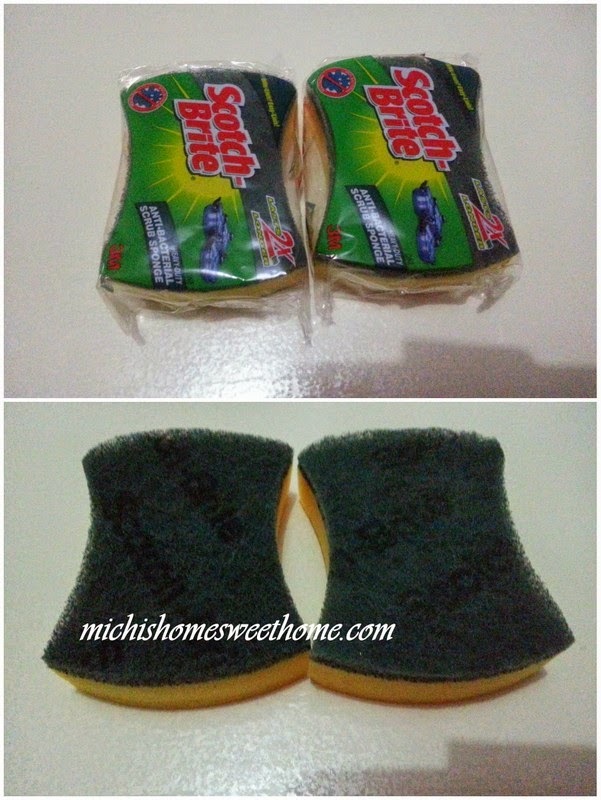 I want small sponge for easy grip so washing the dishes or scrubbing the kitchen countertop won’t be difficult. FYI: "Wet your sponge and then pop it in the microwave for two minutes to eliminate the germs that lurk inside the crevices," says Neil Schachter, MD, medical director of respiratory care at Mount Sinai in New York City, and the author of The Good Doctor's Guide to Colds and Flu. I’m quite sure that we’re all familiar with Lotus Biscoff and Trader Joe's Speculoos Cookie Butter because it is almost all over the social networking media. I can read it on different blogs and I can see it on Facebook, Twitter and Instagram. It seems that everyone is going crazy over this spread that you can only buy in online shop. Knowing me, I’m not into online shopping because I have to go out and deposit the payment and wait for the items at home. Last August 16, I ordered some party stuff for my son’s birthday and my experience wasn’t good. I ordered Friday, made the payment on Sunday via Paypal and received the items 9 days after the payment. It was still fine with me because at least I received the items but I was disappointed because my order was not complete. There’s a missing item so I have to inform the seller and she asked me if I can pick up the item in her bazaar in Rockwell which is not good because I live outside NCR so she said she will ship the missing item. Every week, I have to ask her when she will send the missing item and I got tired already, feeling ko she has no plan to send it so last September 11, I refunded my payment via paypal which of course I did not receive the full amount because she did not chose personal payment. 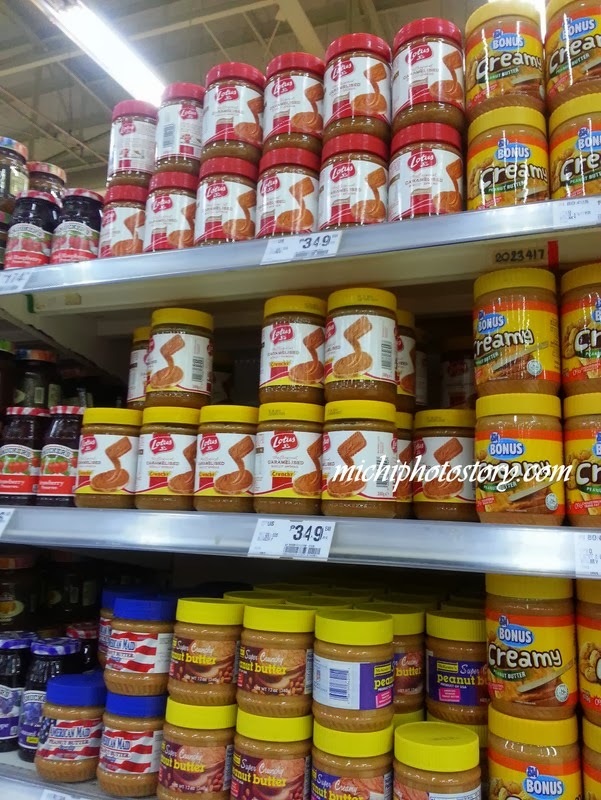 And because I don’t want to experience that again, I don’t want to buy this cookie butter and biscoff spread online. I tried Trader Joe’s Speculoos cookie butter when my sister-in-law brought one jar in my mother-in law’s house few months ago. And last weekend I saw this Lotus “The Original Caramelised Biscuit Spread” in SM supermarket at P349 so I immediately bought one jar. Honestly, my taste buds can’t differentiate which one is better because for me, both taste good but I’m sorry to say that I still prefer peanut butter over this. #loyal But my husband and son love this. This is my son’s new favorite spread at nagsawa na rin sa Nutella. Detoxification is part of my healthy living list and I’ve been meaning to do this for the longest time because I know that I have many toxins in my body because of the food that I eat and the oral medicine that I take to control my psoriasis. I wanted to try the juice cleanse but P7,500 for 3 day cleanse is quite steep for me so until now I haven’t ordered yet. 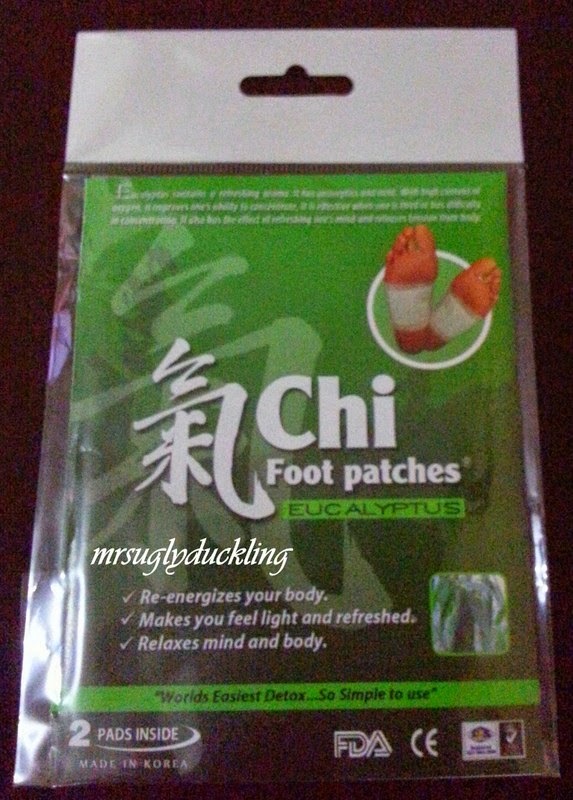 Last Saturday, I went to Watson to buy medicine and my husband saw this Chi Foot Patches Eucalyptus for less than P70. I bought 1 pack and each pack contains two pads. 1.Do not use more than 6 patches at any one time. For detox, it is recommended to use one patch on the sole of each foot. For pain reduction, it is recommended using one patch on each foot corresponding to the are on the diagram overleaf and the another on the painful joint/area. 2.Chi Foot Patches should be left in place for 8hours or until the patch becomes discoloured and damp. 3.Do not place Chi Foot Patches directly over the eyes or open cuts. If you have any health concerns, please consult your medical advisor before using Chi Foot Patches. Since I only bought one, my husband said tig-isa daw kami hehehe so we tried it. The following morning, this is the result. It only proves that I have so many toxins. I will buy this again next time I visit Watson. I must agree that this is the world’s easiest detox and it is so simple to use. In addition, very affordable compared to other detox products. 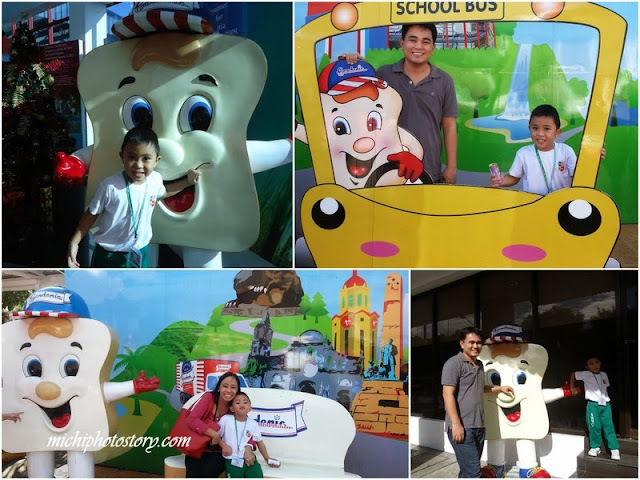 We are indeed frequent buyer of Gardenia bread so when I’ve learned that it is included in my son’s field trip; I became excited because I wanted to see how they make our favorite bread. 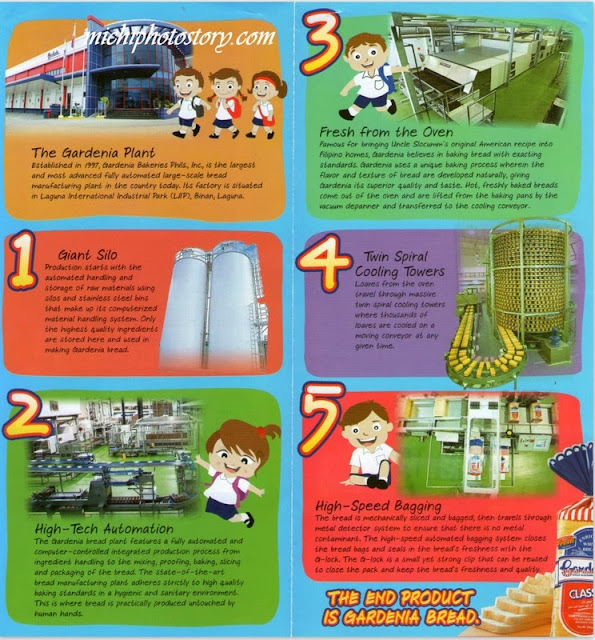 I love plant tour, when I was still in elementary we visited Yakult and Coca-Cola Plant na sobrang nag-igib kami ng coke using our Coleman. 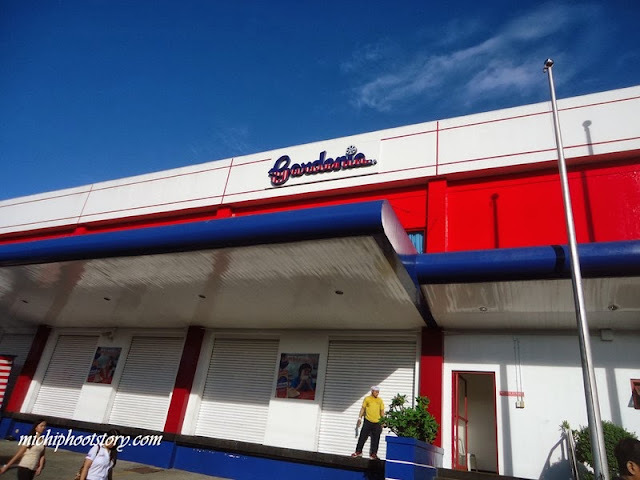 Actually, Gardenia Plant is one tollgate away from our place, it is so near but I haven’t visited. The Plant Tour started with a film showing explaining the brief history of Gardenia Bread and how it is made. We were seated beside the marshall amplifiers at musicians friendshall amplifiers at musicians friend and LCD TV. After that we went to the production area where we can see the whole process from handling, mixing, proofing, baking, slicing and packaging of the bread. Taking pictures are not allowed. Our last stop is the bread store where we can buy Gardenia bread at factory price. You can see classic white bread, healthy-licious bread, flavor-licious bread, bunch of bun, crunchy-licious toasts and snack line. Of course photo-op. Oh I love Gardenia. 1. 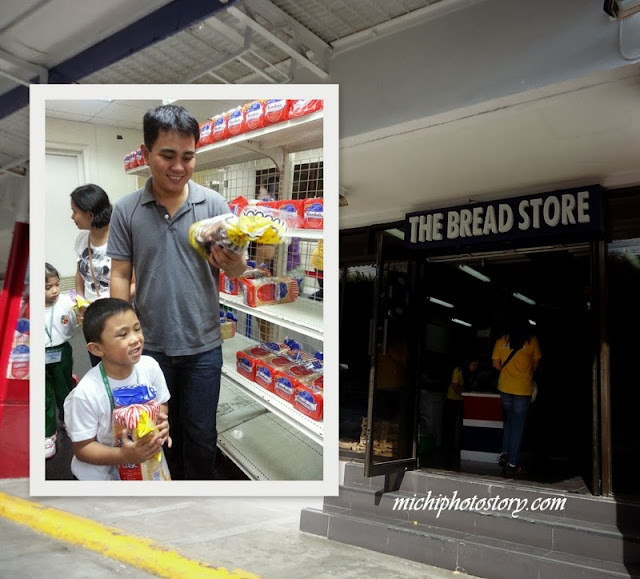 Gardenia’s roots go back to Singapore where it began as a humble in-store bakery in 1978. 2. From Singapore, it expanded its operations in Malaysia, Thailand and Philippines. 3. Gardenia Philippines started its full operations in 1998. 4. The first to introduce G-lock in its packaging. 5. The first to introduce 2 in 1 concept – the Gardenia Double Delights. 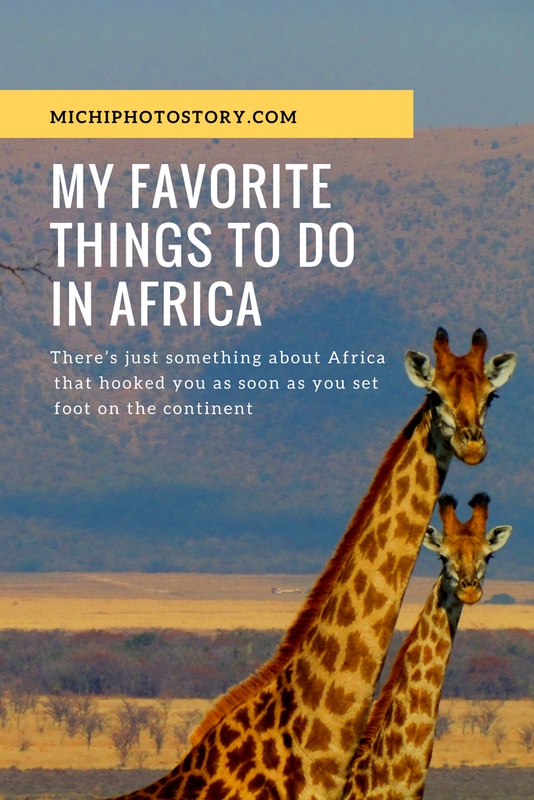 There’s just something about Africa that hooked you as soon as you set foot on the continent. It’s a place of such vastness, intensity, and diversity that you can’t just visit once. Katie, a travel addicted blogger from the UK shares just a few of her favorite experiences in Africa so far. One of the most unique tours I’ve ever been on, traveling by camel in Morocco is an unforgettable experience. It’s part of a two-day trip, which was fairly pricey at 130 euros, but it was all worth it. Setting off from Diabat, which sits between Casablanca and Essouira, we ride through eucalyptus and mimosa forests, before camping overlooking the sea. One of the camels wanders over when we’re finished and we give him some leftover bread. The next morning, we head to Essaouira for a ride across the sands. The infamous winds here pick up as we ride, keeping us cool and providing perfect conditions for the kitesurfers we can see whizzing across the waves. I’m a bit of a water baby so I’m in heaven during a trip to Egypt’s Sharm el Sheikh. 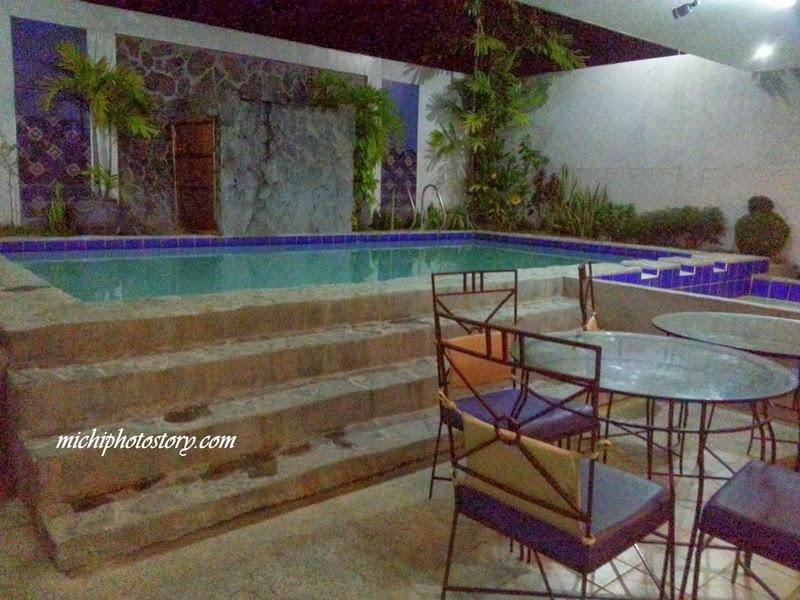 Most of the hotels here have their own private beach, but so long as you pay for your sun lounger and have a drink there, you can usually use them. The Red Sea is as warm as bath water and less than 20 yards from the shore, I spot an amazing array of marine life, including a stingray which swims right beneath me, spiky lionfish and strange looking parrot fish. In Cape Town, I head to the city’s most iconic landmark, Table Mountain. It takes around four hours to get to the top on foot, but I take the cable car, soaring across the city. From the top, you can see the whole of Cape Town, including Signal Hill and the Atlantic Ocean below. There are walking trails and viewing points at the top, along with a café. I’m lucky enough to see lizards basking in the sun and a dassie, which looks a bit like a giant guinea pig, darting into the undergrowth. After I get back down, I see the famous cloud, known as the tablecloth, descend onto the mountain. Boulders beach must be the only place in the world where you can sit in the sunshine eating your picnic, while penguins stand within touching distance. Boulder’s Beach near Simon’s Town in South Africa is home to thousands of little African penguins. You can see them from a wooden walkway. But, if you walk across the first beach you enter and clamber over, or under, some giant boulders, you’ll be one of just a handful of people sharing this space with the penguins. We watch captivated as they waddle their way down to the water looking clownlike, before plunging into the freezing waters and swimming like bullets under the water. In Cairo, I’ve visited the world’s most famous attractions, climbing down claustrophobic staircases into the pyramids and standing with crowds staring at the Spinx. But, my favorite attraction is the Egyptian Museum of Antiquities. Thankfully not there during the uprising, I gaze upon the Tutankhamun treasures, stunned to see such famous finds close up. 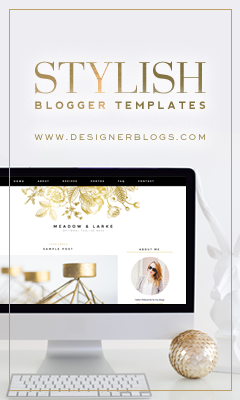 But, it’s not just these standout pieces that make this place something special. It’s the myriad of smaller artifacts, the crowds, the dust, the handwritten signs. It’s just as a museum should be. I spend around three hours there but must have only seen a quarter of what was there. It’s an analogy for Africa really. No matter how much time you spend here, there will always be more to discover. It’s no wonder that Africa becomes something of an addiction. 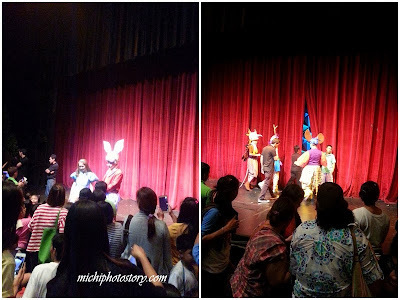 We must admit that watching stage plays is not our thing nowadays especially for our kids who just wanted to watch cartoons and Disney movies or just play video games. I do watch stage plays when I was still in school because it is one of the school requirements but of course, when I graduated, no more stage plays. So it’s been a decade since the last time I’ve watched. 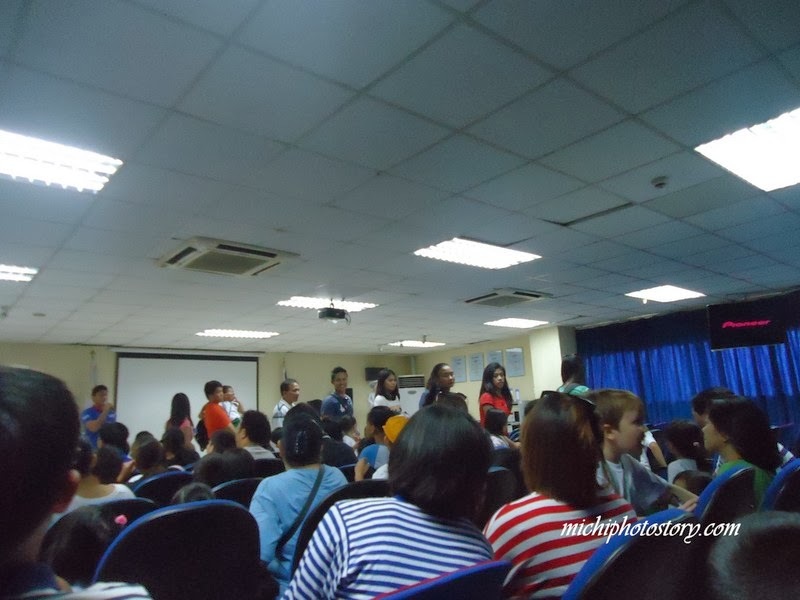 Well, last Tuesday we had a chance to watch a stage play in Repertory Philippines. Alice in Wonderland is one of the itineraries of my son’s field trip. Cameras are not allowed inside and no picture taking during stage play so let me borrow this picture. Unlike other stage plays that I’ve watched, Alice in Wonderland is like an interactive play; they asked questions and even requested audience to sing along. “I’m mad, you’re mad, we’re all mad here”. Honestly, I’m not really familiar with Alice story, all I know is lumaki at lumiit siya. Hehehehe! Anyway, Alice in Wonderland is a story of her incredible journey into a different world where she meets the most surprising set of wild characters. I was a little bit disappointed because of the limited time of picture taking. Hindi ka pa nakakalapit sa stage, tapos na. I was wondering, what kind of speaker they are using for the play, because the sound is clear and very detailed that makes the music play so good. Before taking the Microsoft 70-298: Designing Security for a MS Windows Server 2003 Network exam, IT professionals should have worked for no less than a year designing network infrastructures and implementing desktop operating systems. 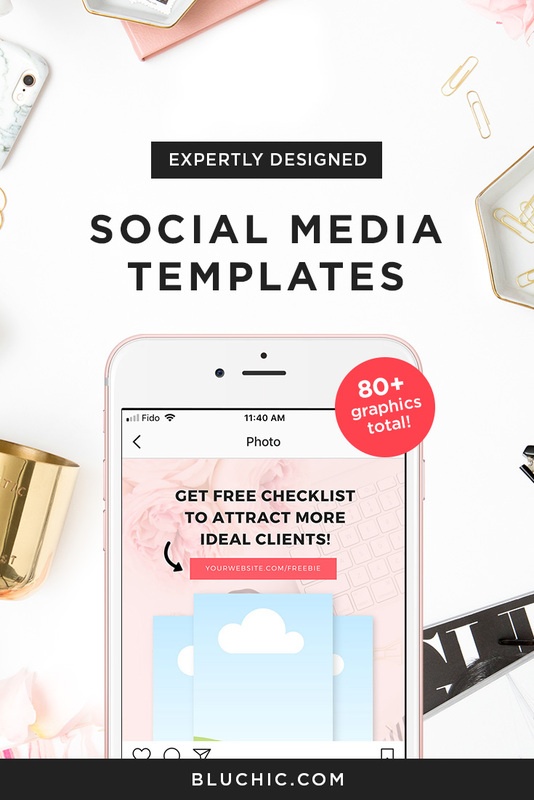 Their work experience should be with medium to large size companies, who have at least 250 users. The best candidates for the 70-298 exam will have expert level knowledge about network services, connectivity requirements between branch offices and users, and general resources relating to the server, such as messaging, print, firewall, and proxies. The 70-298 exam can be taken in any of the following languages: English, French, German, and Japanese. The exam is proctored and counts as a core credit towards both Microsoft Certified Systems Engineer (MCSE) on Windows Server 2003 certification and the Microsoft Certified Systems Engineer (MCSE): Security on Windows Server 2003 certification. Key concepts on the 70-298 exam will focus on the logical, conceptual, and physical designs for the client and network infrastructure security. Candidates also need to be able to understand how to gather and analyze business and technical requirements, and how those relate to designing network infrastructure security. Additionally, takers of the exam must be able to design access control strategies for data. 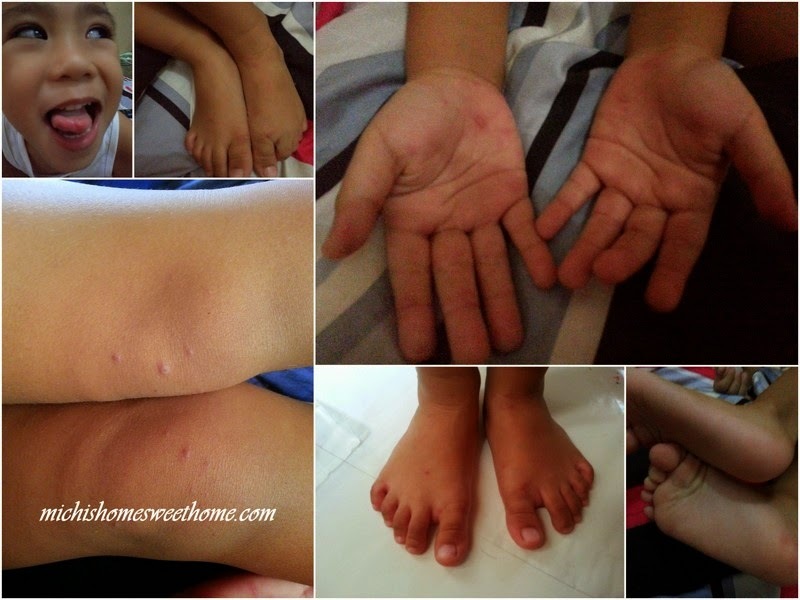 My son had hand, foot and mouth disease, we we’re really shocked when the doctor told us that it was not chicken pox. Evening of November 18, 2013, my son had a slight fever so we immediately gave him paracetamol and the following day (November 19) he was fine so he was able to go to school. After school, while we’re studying my son showed me his elbow and he said “Mommy, look chicken pox” so I checked his body and I found some rashes also in his foot. I was worried and I told my husband about it, when he got home he checked the rashes and he said “baka kagat lang ng langgam”. But for me, it is not a simple insect bite so he said; monitor ko till tomorrow bago kami magpacheck. The next day (November 20), I saw some blisters in the palm of his hands and sole of his feet so I thought my son has chicken pox. I called my husband and we went to the doctor lunch time. The doctor checked his hand and body. She did not see any blisters in the body so she said it was not chicken pox. She checked the mouth and found mouth sore and asked if there are any blisters in the foot and we said yes. She confirmed that it was hand, foot and mouth disease. We’re stunned because we really had no idea where my son got the virus. We only went to school, Festival Mall and S&R before he had the symptoms. We immediately asked if it is contagious and if there’s possibility that we might get it. She said yes so I asked her again how long before my son will be okay because we will be having field trip. She said, in less than a week and advised us to stay in the house for 5 days or until the blisters are all dried. 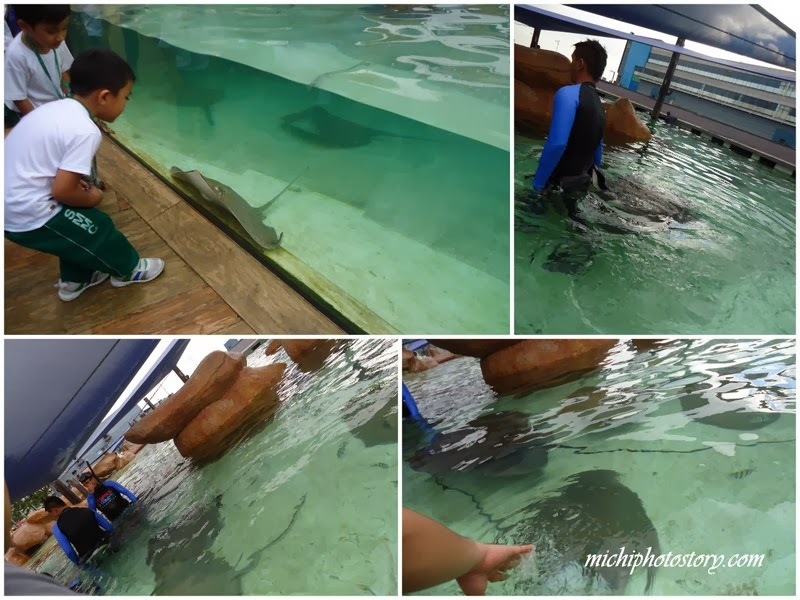 I was paranoid and worried that we could not make it on field trip but I was hoping and praying that my son will be okay because I don’t want to say goodbye to our P5k+ field trip fee. Every day, I was checking and taking photo of his blister to see if there’s any improvement. We wanted to pierce the blister para matuyo agad but I’ve read that it is not advisable. Patience is a virtue and I was glad that we did not do anything. All blisters were dried come Sunday, so I was really happy because he can go back to school and join their field trip. I consulted Google because I was not familiar with hand, foot and mouth disease. I saw some pictures and I was happy that my son had a mild case of HFMD. But the first two days were very hard for him because he can’t eat properly, blame it to the mouth sore. Hand-foot-mouth disease is a common viral illness in children below five years old that causes sore in the mouth, hands and foot. It can also be found in buttocks and legs. It is not similar to foot and mouth disease that occur in animals. HFMD is caused by a virus called an enterovirus which is spreads though sneezing, coughing, touching fluid from the blisters and infected stool. Incubation period is 3 to six days before you see the symptoms. Some people have the ability to monitor and moderate different areas of life. They can choose to only eat one piece of cake instead of five, only eat French fries once a week, and only have one glass of wine at dinner. Each individual is good at least one thing, some are good at physical tasks, others are good at mental tasks, and some people are good at emotional tasks. If you or a loved one is struggling with the ability to moderate alcohol in a healthy way, just remember, everyone has their strengths and everyone has their weaknesses. The only true weakness is not admitting weakness. When you need extra help to conquer the weaknesses in life, look to a professional in-patient program. You can find many to evaluate and choose from such as www.sherwoodhillsrecoveryresort.com and other such facilities you can research on the Internet. Do you ever lie to your family or friends about your drinking habits? 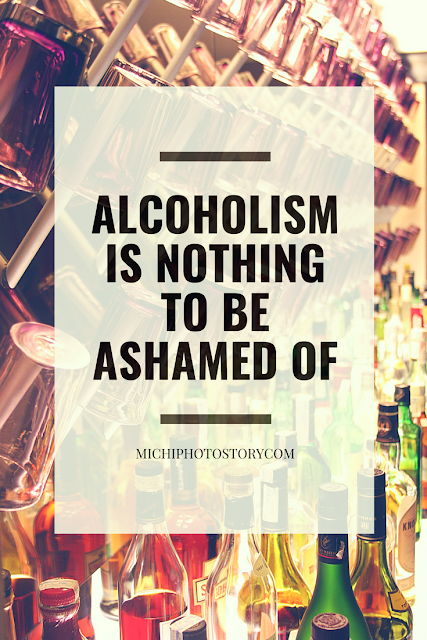 Do you ever feel guilty or ashamed about your drinking habits? Do you need to drink to feel ‘normal’ or relax? Do you drink more alcohol than you intend to? When you drink, do you black out and forget what you did? Do you have to drink more than usual to get a buzz? Do you drink even though you know it causes relationship problems? Has drinking caused you to give up activities or hobbies that you once enjoyed? Do you have to drink in the morning to not feel ill? If you have honestly answered yes to any of these questions, you probably have an issue that needs to be addressed. With the professionals you will find while during research at www.sherwoodhillsrecoveryresort.com and other such sites on the Internet, you will be able to get the help you need to be able to moderate your alcohol or quit altogether. The best thing is that you can receive high-quality treatment while staying in a high-quality facility. 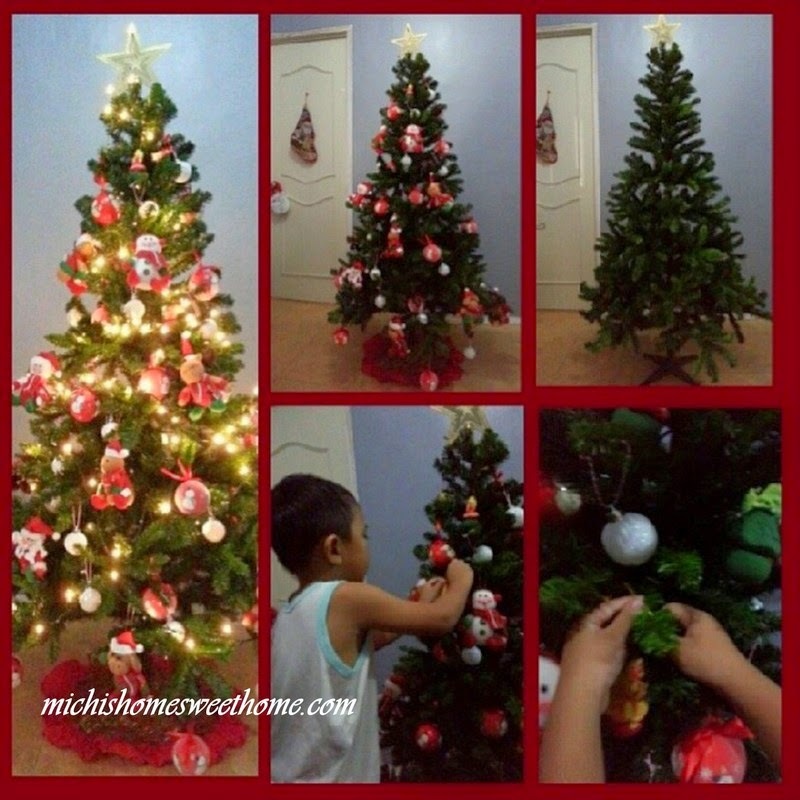 As they always say, Christmas in the Philippines starts in September so some people decorate their homes as soon as ber months start. 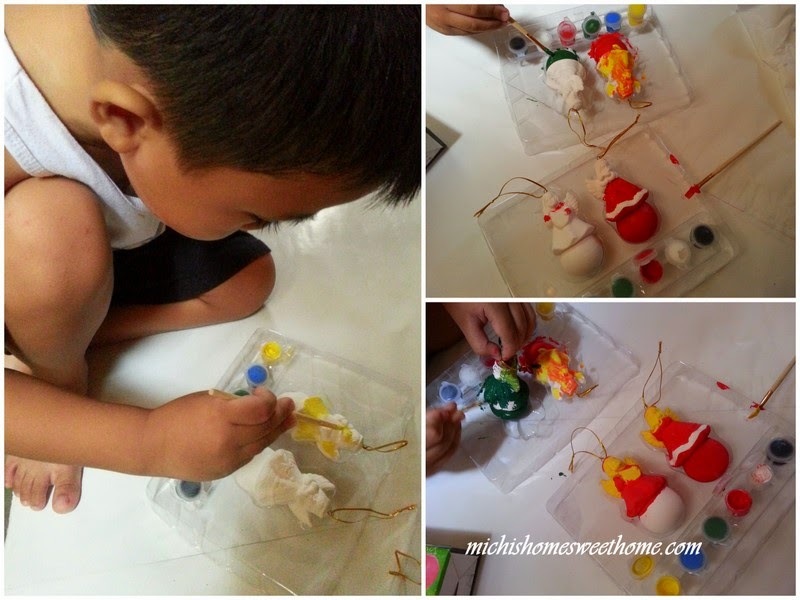 But in our case, we usually decorate our home every first week of December but since last year we started as early as November because of my son. He really wanted to put up the Christmas tree because he always sees our neighbors decorations. Well, since I don’t usually change theme every year because I find Christmas decors too expensive so I will reuse our old decors and just added new ornaments. 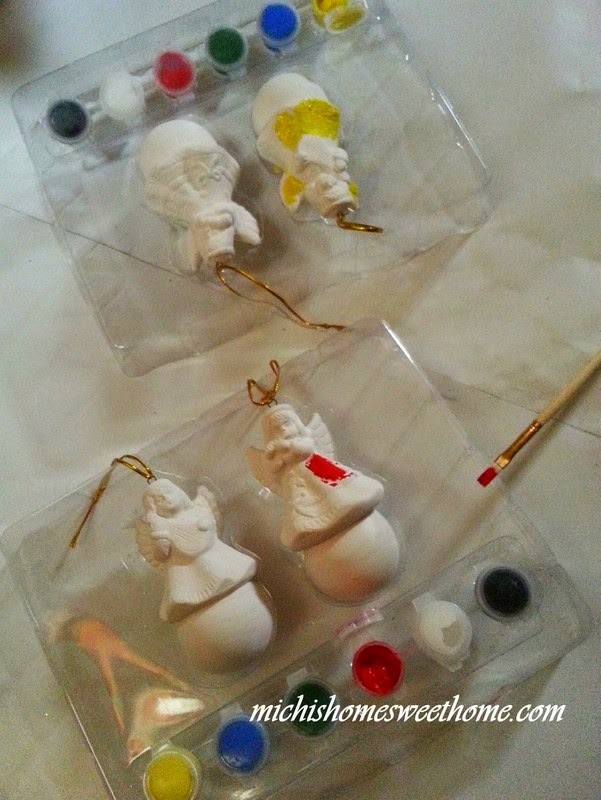 Our DIY Christmas ornaments and Christmas balls which I bought for less than P200. After few minutes, our Christmas tree is finally up. 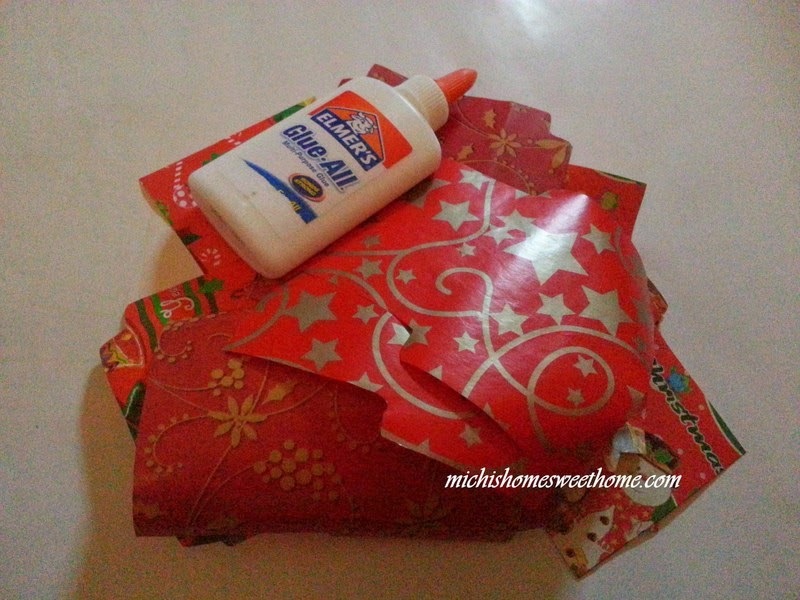 Gifts na lang kulang. 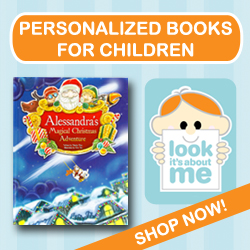 Christmas is indeed fast approaching and bazaars are everywhere. But if there’s one bazaar that I never fail to visit, that is Noel Discovery Bazaar. I always check this bazaar every year since 2007. 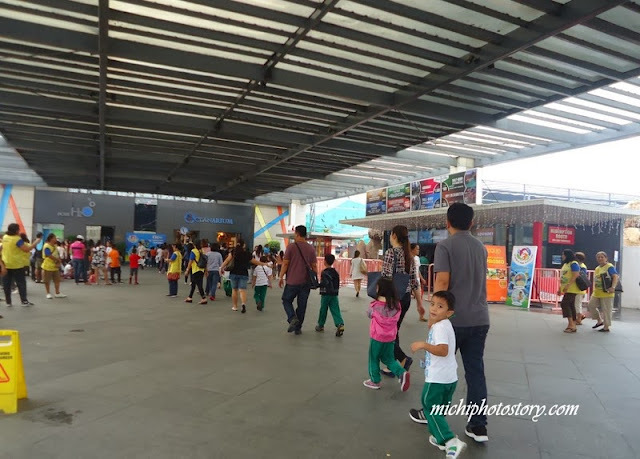 Last Saturday, my husband told me that he needs to go to the office so I suggested that we will go with him so after his meeting we can go to Noel Bazaar. Yay! win-win situation. My husband texted my mother-in-law who is now interested to visit bazaars too, ever since I brought her to Heat Wave Summer Bazaar last year. 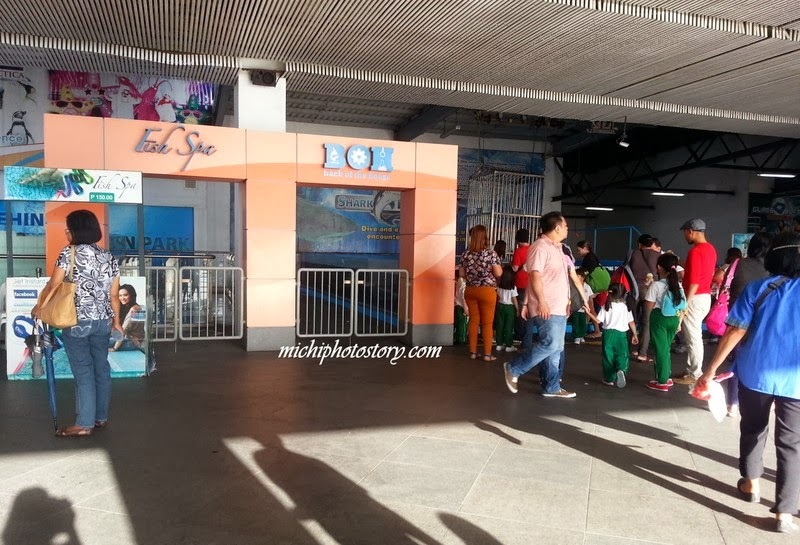 Compared last year, I enjoyed my visit last Saturday because there are a lot of affordable booths. There are booths that sell everything for P50, P100 and P150. There is buy 1 take 1 perfume too at P100 and P350. There are kitchen and other home stuff and I was looking for pull out waste containers from ovisonline.com but I did not see anything similar. I’m happy to see the stores that I follow on Instagram like Mumi Bag and United Village Breadhouse. It took me more than 3 hours to finish my booth hopping. You can visit Noel Bazaar in World Trade Center from November 22 to December 1, 2013. Entrance fee is P50. We went to National Bookstore last Saturday, I was buying materials for my son’s assignment which is a world map. 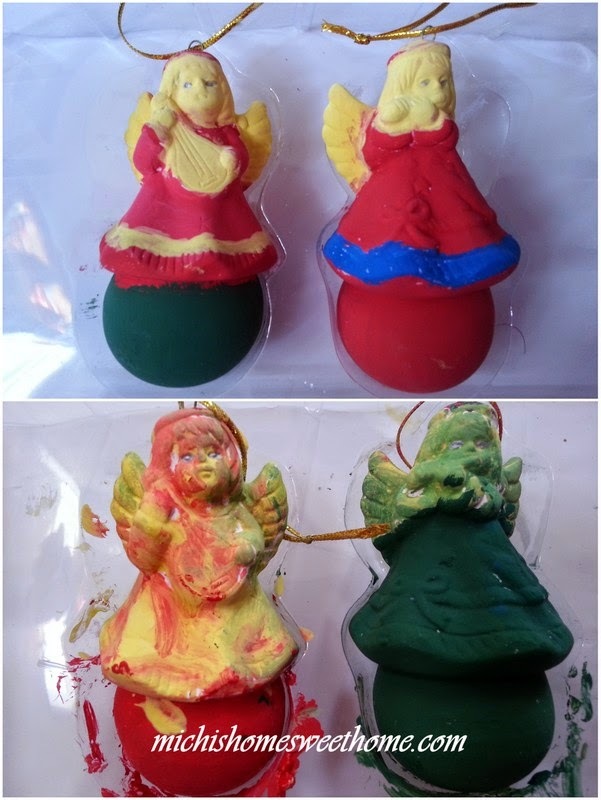 My husband saw this DIY Christmas Angel ornaments and decided to buy it for my son. I was hesitant at first because it is made of porcelain but my husband wanted it so much para naman may personal touch ang aming Christmas tree. 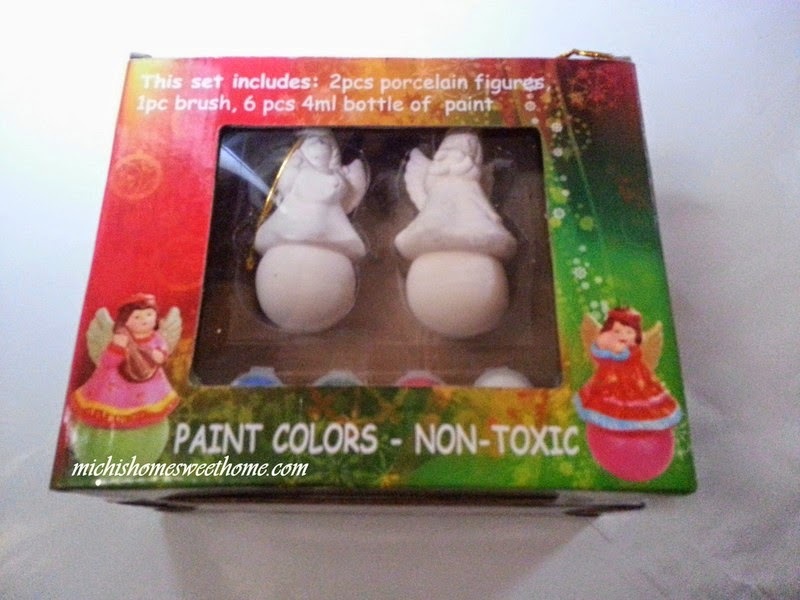 It is Buy 1 Take 1 at P99.75, there are Christmas balls, Santa Claus and Angels Figurine. 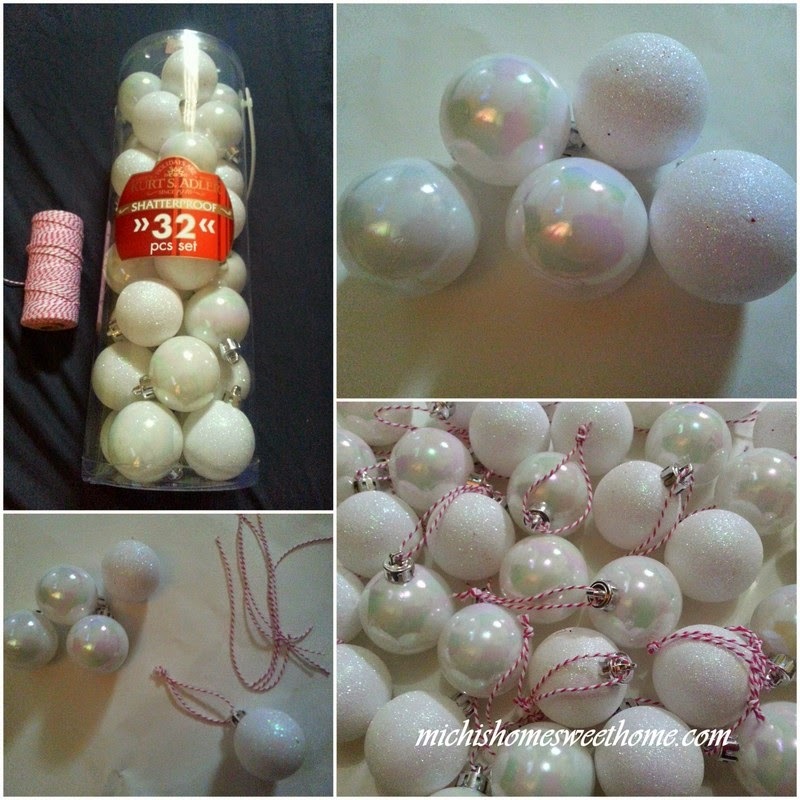 I want the Christmas balls para madali lang but my husband wants the Angels para maiba naman at puro Christmas balls na lang daw.